Mr. Billow is a distinguished pilot with over 45 years of flying experience. He has over 15,000 fixed and rotary wing flight hours; 1,250 hours acquired during combat missions. From 1970 through 1971, Mr. Billow served his country during the Vietnam War flying attack helicopters with the A Troop, 3/17th Air Calvary (1970-1971). Mike is an FAA Certified Instructor and Instrument Instructor in both Rotary Wing Multiengine Airplanes. Mr. Billow’s extraordinary awards include military recognitions such as: Legion of Merit, Distinguished Flying Cross with 2 oak leaf clusters, Bronze Star with one oak leaf cluster, Meritorious Service Medal, Air Medal with 44 oak leaf clusters and a Governor’s Proclamation to name a few. He had the distinction of becoming the first Chief Warrant Officer 5 for the Nevada Army National Guard in 1993. Mr. Billow served with the U.S. Army and Army National Guard until his retirement in 2009, with over 40 years of service. Retirement and civilian life have not been dull, but rather a continuation of Mr. Billow’s exceptional experiences. His civilian flight proficiency includes seasonal piloting for mineral, gas and oil exploration, emergency medical services and off shore commercial fishing across the globe. Additionally, Mr. Billow is a member of the Screen Actors Guild with major motion picture credits for his work on Courage Under Fire and Con-Air as an AH-1 Cobra Attack Helicopter stunt pilot. In 2002, he became an aviation world record holder with the Federation Aeronautique Internationalle (FAI) and the United States Aeronautical Association for Class C-1.f Group II: Altitude with a 1000kg payload: 34,500MSL flying a Beech 200 King Air airplane. 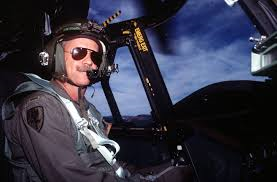 Mr. Billow is a serving member of the Vietnam Helicopter Museum’s Board of Directors; contributing his specialized knowledge of the AH-1 Cobra Attack Helicopter. His experience is a key aspect of our ongoing Cobra restoration projects. So sorry to hear of your dad’s passing. Glad you and Lance had some time to get to know each other. He’s a great son! Reminded my of Jan many times , in the manner he walked talked and his sense of humor. Jan was very special to me. He was my first love. We just drifted apart..got married very young. Lance says you look a lot like your dad. ..That’s a good thing. Sounds like things are going well for you…glad to hear that. On hearing of your dad’s death ……it brought back many happy memories!